Home » News » Happy Thanksgiving! 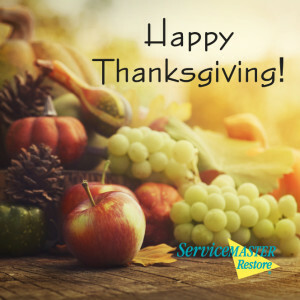 In this time of gratitude, we give thanks for you, our customers and friends. We value your patronage and appreciate your loyalty and confidence in ServiceMaster NCR. Call 855-957-6627 to reach our disaster response center 24 hours per day, 7 days per week and 365 days per year. We wish you a very happy 2015 full of Peace, Prosperity & Purpose.